Becs d'oiseaux - Dictionnaire Visuel - Copyright © 2005-2016 - Tous droits réservés. [img]https://infovisual.info//storage/app/media/02/img_fr/060 Becs oiseaux.jpg[/img] [url=https://infovisual.info/fr][/url] - [url=http://www.infovisual.info/]Dictionnaire Visuel[/url] - Copyright © 2005-2016 - Tous droits réservés. 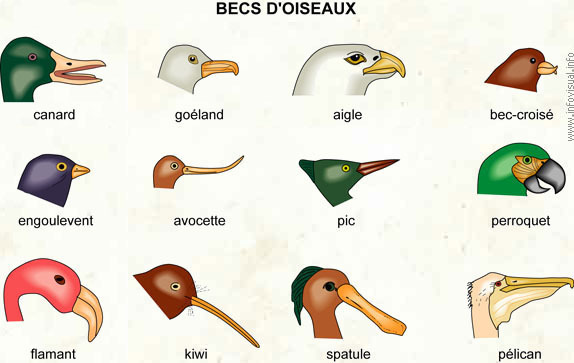 Becs d'oiseaux: différents types de bouches de l'oiseau, constitués des mâchoires recouvertes de mandibules cornées. Elles sont dépourvues de dents. Goéland: oiseau piscivore habitant les rivages. Aigle: oiseau rapace habitant les hautes montagnes. Bec-croisé: oiseau dont les mandibules se croisent à leur bout. Engoulevent: oiseau nocturne chassant les insectes en volant le bec grand ouvert. Avocette: oiseau échassier au bec recourbé vers le haut. Pic: oiseau grimpeur se nourrissant de larves qu'il trouve dans l'écorce des arbres. Perroquet: oiseau exotique capable d'imiter des sons et des paroles humaines. Flamant: grand oiseau aux plumes roses, au long cou et au gros bec lamelleux. Kiwi: oiseau de la Nouvelle-Zélande qui ne vole pas. Se nourrit de vers et dépose son oeuf dans la boue. Spatule: oiseau échassier au bec long et aplati. Pélican: oiseau piscivore dont le bec est pourvu d'une poche pour emmagasiner les poissons sevant à nourrir les jeunes. The Goshawk is a medium-large bird of prey in the family Accipitridae, which also includes other diurnal raptors, such as eagles, buzzards and harriers. It is a widespread species that inhabits the temperate parts of the northern hemisphere. In North America, it is called the Northern Goshawk. It is mainly resident, but birds from colder regions of north Asia and Canada migrate south for the winter. The goshawk appears on the flag of the Azores. The archipelago of the Azores, Portugal takes its name from the Portuguese word for goshawk (açor), because the explorers who first discovered the archipelago thought the birds of prey they saw there were goshawks; later it was determined that these birds were in fact milvuses or a type of common buzzard (Buteo buteo rothschildi). The Goshawk is the largest member of the genus Accipiter. It is a raptor with short broad wings and a long tail, both adaptations to manoeuvring through trees in the forests it lives and nests in. The male is blue-grey above and barred grey below, 49-57 cm (19"-22") long with a 93-105 cm (37"-41") wingspan. The much larger female is 58-64 cm (23"-25") long with a 108-127 cm (42"-50") wingspan, slate grey above grey below. Males of the smaller races can weigh as little as 630 grams (1.4 pounds), whereas females of the larger races can weigh as much as 2 kg (4.4 lbs). The juvenile is brown above and barred brown below. The flight is a characteristic "five slow flaps, straight glide". In Eurasia, the male is sometimes confused with a female Sparrowhawk, but is larger, much bulkier and has relatively longer wings. In North America, juveniles are sometimes confused for the smaller Sharp-shinned Hawks and Cooper's Hawks, but the size again is a distinctive feature of the goshawk. This species hunts birds and mammals in woodland, relying on its speed of flight through the dense forest as it flies from a perch or hedge-hops to catch its prey unaware. These are usually opportunistic predators, as are most raptors, but the most important prey species are birds, especially the ruffed grouse, columbiformes, and passerines. Other waterfowl, up to the size of mallard duck, are sometimes preyed on. Prey is often smaller than the hunting hawk, but these birds will also rarely kill much larger animals, up to the size of snowshoe hares and jack rabbits. In the spring breeding season, the Goshawk has a spectacular roller coaster display, and this is the best time to see this secretive forest bird. At this time, the surprisingly gull-like call of this bird is sometimes heard. Adults return to their nesting territories by March or April and begin laying eggs in April or May. These territories almost include tracts of large, mature trees that the parent will nest in. The clutch size is usually 2 to 4, but anywhere from 1 to 5 eggs may be laid. The eggs average 59 x 45 mm (2.3 x 1.8 in) and weigh about 60 g (2.1 oz). The incubation period can range from 28 to 38 days. The young leave the nest after about 35 days and start trying to fly another 10 days later. The young may remain in their parents territory for up to a year of age. Adults defend their territories fiercely from everything, including passing humans, so even the eggs have few predators. Birds of any age may be attacked, rarely, by Bubo owls and large Buteo hawks, but these often cede to or are themselves killed by the aggressive goshawk.